Cala Saona is a magnificent beach very popular with tourists and is known for its red rocks that surround it. You can enjoy spectacular sunsets over the sea. 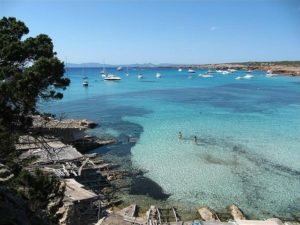 Cala Saona is about 5 km from Sant Francesc in a southwest direction and is located between Punta Rasa and Calo d’en Trull. This beach of fine white sand, is the only one in the west of the island and is certainly one of the most beautiful and popular beaches thanks to the wonderful environment in which it is located, within a bay protected on both sides by towering red rocks. Its extension is quite small, about 200 meters in length and 140 in width. It is lapped by clear turquoise waters and this makes Cala Saona a perfect destination for lovers of the sea. You may also see fishermen sliding their traditional beach boats into the crystal clear waters on long wooden rails located at one end of the bay, especially in the summer season. The area around this wonderful beach is very beautiful and has a lush vegetation that surrounds the whole bay. 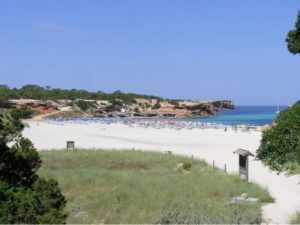 Besides this you can also find plenty of trails that run along the coast south of Cala Saona and reach the cliffs of Punta Rasa by a short stroll or alternatively you can walk along paths, where nature is still unspoiled, that offer visitors numerous shaded areas where have your picnic or just relax while sheltering from the midday sun. 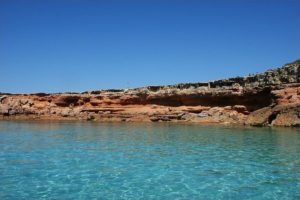 Another advantage of Cala Saona beach is the spectacular view from the coast, in fact, the contrast between the red rocks and the intense blue of the water allows to see a picturesque landscape and you can also admire wonderful sunsets over the sea that are considered among the most beautiful on the island. The beach is well equipped and offers a restaurant overlooking the sea, located at one end, and a beach bar (“chiringuito”) located at the other end where you can have a drink waiting for the sunset or “Puesta de Sol” that, here in Formentera, is an unmissable rite. For those who arrive at the beach by car, motorcycle or bicycle there is free parking nearby, otherwise there is a conveniently located bus stop just 100 meters from the beach. Linea L5 con fermate a Sant Francesc ed a La Savina. Book using the promotional code ESTATE123 and save with our partners. The code is valid for EVERYONE. You can take advantage of discounts even if we could not provide the right accommodation for you.